The purpose of this blog is to follow the trials and tribulations of a vegetable and flower gardener in South Oxfordshire. Our plot is just under an acre, not far from the River Thames. The front garden is mostly laid to lawn. The frontage has a rail and post fence that has recently planted natural hedging comprised of beech, hawthorn, blackthorn and field maple. We lost a few beech whips, but most are doing well and the hedge is starting to look a little more established now. A large part of the back garden is laid to lawn and functions as football pitch, rugby field, tennis court and cricket oval to our 3 boys. 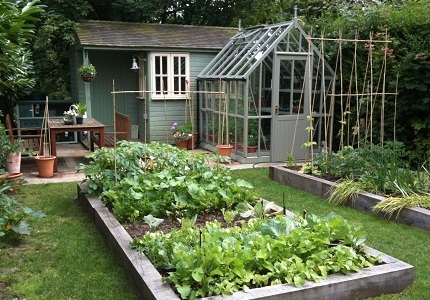 Tucked away at the back of the garden we have two raised vegetable patches, a greenhouse and shed. Garden Posts is written by a South Oxfordshire gardener to detail his vegetable and flower gardening successes, failures and learnings. Thanks for contacting me and following my blog. Yours is great and your veg patch looks so neat and tidy. I also love your greenhouse, what make is it ? I just have a small 6 x 6 aluminium (which is secondhand) and its on the allotment. I’m glad you contacted me as I will now pop back and read some of your older posts. Thanks Maureen. The greenhouse is an Alton Victorian greenhouse. I think its 8 x 6 or thereabouts in green painted ceder. I am really pleased with it.